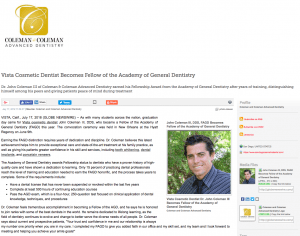 Dr. John Coleman III of Coleman & Coleman Advanced Dentistry earned his Fellowship Award from the Academy of General Dentistry after years of training, distinguishing himself among his peers and giving patients peace of mind during treatment. Vista, CA — As with many students across the nation, graduation day came for Vista cosmetic dentist John Coleman III, DDS, who became a Fellow of the Academy of General Dentistry (FAGD) this year. The convocation ceremony was held in New Orleans at the Hyatt Regency on June 9th.